Open your way to a safer home with the most beautiful yet secure of safety gates possible. WHICH? recommended product, all Fred Stair Gates meet current EU Safety Standards. Safety gates have become beautiful! Combining contemporary modern style with uncompromising levels of safety, Fred has created a range of gates that are unparalleled in their elegance and effectiveness. Made from the highest possible quality materials throughout, the crystal-clear professional grade Acryllic is a barrier of brilliance. Details such as the glow strip to illuminate the bottom rail, the extra sure magnetic slam-shut locking system and the Accu-Fit™ indicators (that make installation easy and ensure that you always know that the gate remains set up correctly), give you the peace of mind that you need. Pressure gates ALWAYS need to be fitted with wall cups, but with our Fred SecureHold™ adhesive, these can simply be fitted with adhesive against wood - though you'll still need to use screws for fitting the wall cups to other surfaces. In brief, we can give you 4 great reasons for installing this Fred pressure-fit safety gate. WHICH? recommended product, all Fred Stair Gates meet current EU Safety Standards. If you have narrow spindles that you wish to fit this stairgate to, simply use our Y Spindle accessory. In some situations, the opening that you are trying to protect makes it awkward to fit a stairgate. If this is the case in your home, take a look at our Stairpost or Wall and Skirting Fitting Kits which are designed to help. Click here to see the other stair gates in our range. "Get in the habit of closing the gate every time you pass through, even when your child is asleep. Ensure that visitors know to do the same." Why does it only fit bottom stairs? I'm looking for stair gates that will fit top and bottom and would like them to match. 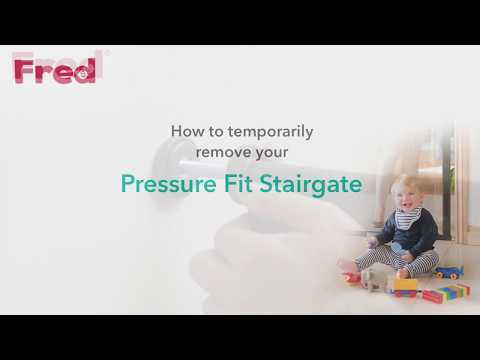 The Fred Pressure fit gates are not suitable for the top of the stairs because there is a bar that runs along the bottom of the gate that applies the pressure to make the gate secure. When located at the top of the stairs, this could be a trip hazard, so it is best to purchase the clear-view Screw Fit gate as this does not have a bar. I have just received my Fred Pressure Gate but the metal frame does not line up with the lock on the gate, please help! When the gates arrive there is a cable tie to hold the Extenders, frame and handle together. Cutting this cable tie makes it easy for the Gate to unlock, and it will appear that the frame no longer fits. Please note that this is completely normal, the frame of a pressure gate is designed to push out so that it is as secure as possible once fitted. If your Gate becomes unlocked in this way, simply pull the lock and frame together and lock the Gate. You can re-secure the Gate with a 30cm cable tie, or simply be careful to keep the Gate locked while you fit it in the normal way. If I fit this to a doorway, can the door then be closed .....? 12 months from date of purchase. The guarantee extends only to the original retail purchaser and proof of purchase is required. Wipe-clean with a soft, damp cloth should do it. Simply use water, or if necessary a mild detergent in the water, to dampen the cloth.